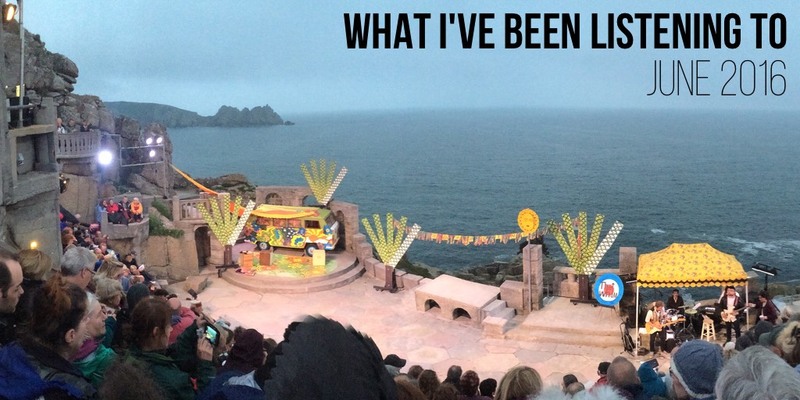 A view from the audience of the Minack theatre in Porthcurno, Cornwall. This was a performance of an adapted version of Shakespeare’s ‘As You Like It’ by OVO theatre. Needless to say, the show was as superb as the view. Well, what a bleak month it has been. From widespread mass shootings across the entire globe to the UK being brought into political and socioeconomic turmoil, this is a month I’m glad to be finished with. However, it’s not all bad. We managed to get away on a nice weekend trip to Cornwall, from which the Minack theatre in Porthcurno is pictured above. And so, it seems apt that this month I’ve been listening to a mix of both happy and introspective tunes this month. Let’s get on with the show. Not wanting to buck the trend of bands with silly names actually being really rather good, I present this tune by Spock’s Beard. Since I first laid my ears on the majesty that is Pink Floyd, I’ve always had a special place for well executed prog rock. And this, although of the more modern variety that I don’t usually embrace quite as readily, is a fine example of prog rock. This screams Yes if they were inspired by 90s alt rock. None the less, it’s a great way to kick off the album, and a great way to kick off this months list. This is one that I’ve enjoyed for years, but started listening to it again while compiling this post. The progression from the almost acoustic acoustic guitar / vocal combo that starts off this song, followed by the sudden build as we come crashing into the chorus, puts me in mind of ‘Mother’ by Pink Floyd. This is still a great piece of contemporary prog that should probably be listened to at least once by anyone who considers their self a fan of the genre. Changing gear for just a minute, did you know that Steve Martin was actually an accomplished banjo player? I didn’t until I saw an album (So Familiar) he recorded with singer / songwriter Edie Brickell where both of them show off their chops. There’s plenty of feel-good country songs on this album, but my favourite is this fun and rebellious song which straddles the country-pop line expertly. What would a prog rock themed post from me be without some Pink Floyd. On this particular occasion I chose to feature one that doesn’t get all that much lovely normally. However, this song will now forever be known as the song that ends season 4 of Person of Interest. At the behest of my friend, I’ve been trying to catch up on PoI before it finishes later this month. I’ve never been a fan of this song, but honestly I’d be hard pushed to match a more utterly perfect tune for this section. I won’t spoil anything in case you have yet to get there, or even worse find the amazingness that is PoI for yourself yet, but this is absolutely ideal. I’ve been a fan of John Williams, Herbie Flowers, Tristan Fry, Francis Monkman and their motley crew of expert session musicians for as long as I’d care to remember. I’ve listened to their first LP so much that Westway is practically indelibly emblazoned into my mind. Just to be clear, this is great because Sky makes bloody good music. I’m forever trawling through their catalogue and discovering great tunes. This is just one such of those. Just put on a nice pair of headphones, shut your eyes and have a few minutes of zen basking in the glory of Sky. Christina Grimmie is someone I have followed for many years, from her humble beginnings on YouTube, to winning The Voice, to releasing her major label debut. Tragically, on the 10th June 2016 she was shot to death while signing autographs after her show in Orlando, Florida. It’s truly sad to see such a promising singer, and a genuinely nice seeming person, see their end so early in their life and so tragically. When I heard this terrible news, I instantly remembered one of my abiding memories of her musical career; her simply mesmerising cover of ‘Your Song’, originally by Elton John. Unfortunately, it’s disappeared from her official channel, however the diligent people of YouTube has mirrored it for posterity. I hope you enjoy this rendition, and in light of her passing, it seems only the more poignant. When my friend first introduced me to SPG a couple years ago, I honestly wasn’t sold on these folks at first. However, after listening to their collaboration with Professor Elemental I remembered that these folks existed and well, the rest of the evening was dedicated to watching their videos and listening to their albums. The music is good old fashioned folk for the most part, with the occasional modern influence sneaking in here and there, but the niche is that it’s all steampunk themed and the band members are meant to be singing automata. Even live there are some amazingly solid harmonies and it’s just a good time. I’ve been a fan of Orla since first hearing Lonely People in Spotify’s discovery playlists. I’ve listened to her few EPs more times than I’d really care to disclose in public. Her songwriting is sharp and her singing is always bang on. I’ve been waiting for some new material for ages, so this was a much welcome tune to tide me over until her next release. Great Good Fine Ok also put in a superb performance on this track, so be sure to check it out. Well, that cover that tumultuous months worth of listening. Please do join me for July, which will (hopefully) be of a much less sombre tone. Until then, keep listening.